It's earnings season and the sprinkling of quarterly reports has turned into a storm. 1. Earnings: Wall Street will be flooded with quarterly updates this morning from the likes of GM (GM), Blackstone (BX), Verizon (VZ) and Southwest Airlines (LUV). After the close, investors will hear from Microsoft (MSFT), Google parent company Alphabet (GOOGL), Starbucks (SBUX) and Visa (V). 2. Stock market movers -- Mattel, Ericsson, AmEx, Yum: Mattel (MAT) shares are taking a dive in extended trading after the toy company missed earnings expectations on Wednesday evening. Shares in Ericsson (ERIC) are falling by about 9% on the Nasdaq Nordic exchange as investors express their disappointment with the latest earnings from the Swedish firm. Meanwhile, shares in American Express (AXP) and Yum! Brands (YUM) are set to pop after both firms reported better-than-expected results. 3. All eyes on automakers -- Mitsubishi, Volkswagen: Shares in Mitsubishi Motors tanked by 20.5% in Japan following a 15% drop on Wednesday. Investors pushed the sell button after learning that the automaker had illegally rigged fuel economy tests affecting hundreds of thousands of vehicles. The Mitsubishi announcement follows a huge scandal that rocked German auto giant Volkswagen (VLKAY) last year after it admitted to rigging diesel engine emissions tests in America and Europe. But shares in Volkswagen are rising Thursday based on reports that the company could announce plans today to buy back about 500,000 U.S. diesel cars that used the emissions cheating software. Buybacks will be expensive, but investors are relieved that the company is taking steps to resolve the costly scandal. 4. 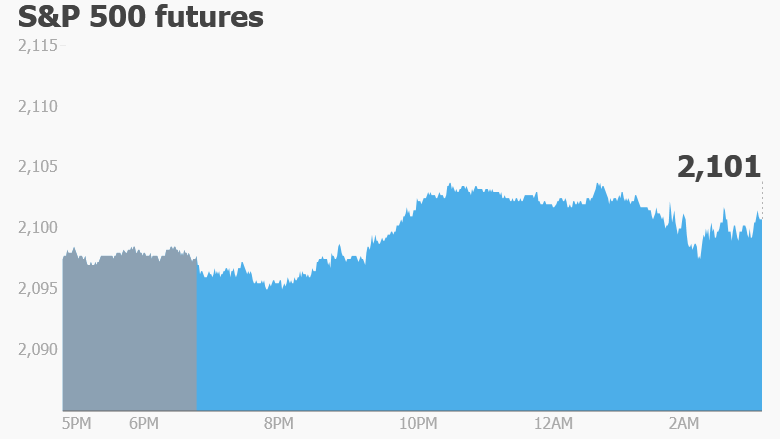 Global stock market overview: U.S. stock futures are little changed ahead of the open. European markets are muted in early trading, while most Asian indexes closed the day with gains. 5. Market recap: Wednesday was relatively uneventful. Markets climbed in the morning but retreated in the afternoon. By the close of trading, the Dow Jones industrial average held onto a gain of 0.2%, the S&P 500 added 0.1% and the Nasdaq was up 0.2%.